Have you finished your holiday shopping yet? Me neither. To me that would normally mean another weekend of dealing with traffic, trying to move through crowded stores, and waiting in lines. This year I’m trying something new when it comes to those small, last-minute gifts for my friends and family. 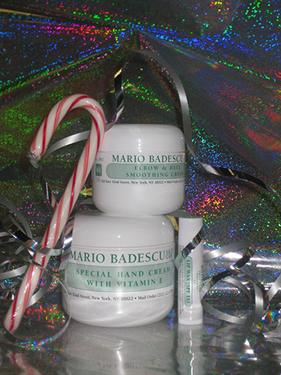 I’m going to get some pretty, cheap ribbons and some clear glassine bags (or some pretty gift bags and tissue paper if I’m really pressed for time) and make my own holiday gift kit with Mario Badescu products and maybe some candy or chocolates. Winter is harsh, and everybody can appreciate the gift of good skin care, and it packages together to make a really cute – and cheap – present. $28. Who wouldn’t like that? $15 Great as a intensely moisturizing winter treat for anyone! Even simpler? Try the Raspberry Body Scrub $15. Delish! Anyone would love this. Yikes, I used a Rachael Ray-ism. Strike that from the record. Being creative and thoughtful doesn’t have to cost a lot of money. If you need suggestions or ideas or just don’t have a clue, call me!